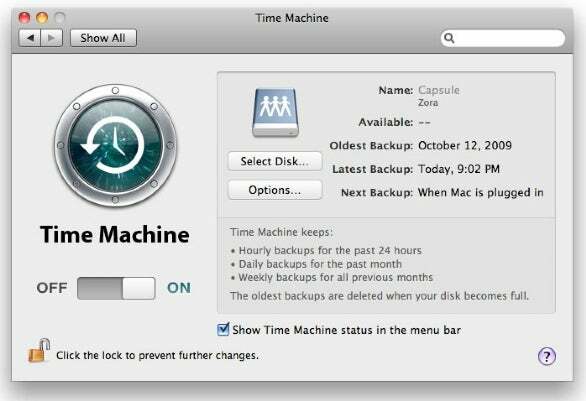 If you’ve been using Time Machine for backups, there may come a time when you outgrow your backup disk. It’s easy enough to plug in a larger disk or buy a Time Capsule (or a larger Time Capsule) and choose that as your new Time Machine destination, but doing that means starting over. If you want to move to a larger disk while maintaining the continuity of your backups, you can. It just means taking quite a few steps. To move your backups from a local disk to a Time Capsule, do the following. Set up your new Time Capsule (according to Apple’s instructions), but leave your current backup disk mounted in the Finder. If possible, connect your Mac to your Time Capsule using an Ethernet cable, which will speed up the transfer process considerably. Open the Time Machine pane of System Preferences, click on Select Disk (or Change Disk, in Leopard), and select your Time Capsule disk as the destination. Click on Use For Backup. Choose Back Up Now from the Time Machine menu in your Mac’s main menu bar and allow Time Machine to begin backing up your Mac to the Time Capsule. Once the Time Machine preference pane shows that the program has finished preparing and is actively copying data, turn Time Machine off by doing clicking the On/Off button in the Time Machine pane of System Preferences. Select your Time Capsule in the sidebar of any Finder window and double-click on the folder inside it (which may be named “Data” or “Backups”) containing your Time Machine backups. If the disk doesn’t mount automatically, click on Connect As, and supply your user name and password if prompted to do so. This folder should contain a single disk image, which holds your recently aborted Time Machine backup. Double-click on this disk image to mount it in the Finder. Open Disk Utility (in /Applications/Utilities). In the list on the left, select your local Time Machine backup volume and click on the Restore tab. Drag your local backup volume (the indented volume name, not the disk name) from the list on the left into Disk Utility’s Source field. Drag the mounted disk image (named “Time Machine Backups”) from the list on the left into Disk Utility’s Destination field. Make sure the Erase Destination checkbox is selected, as it should be by default. Click on Restore, and click on Restore again to confirm. Now be prepared to wait while Disk Utility copies the files—this process could take hours or even days. When the restoration is finished, quit Disk Utility and eject the disk image from your Time Capsule. You can then turn Time Machine back on, and your backups should proceed normally. If you’re moving from a smaller Time Capsule to a larger one, you’ll follow essentially the same steps, except that you should connect both Time Capsules at the same time, using the old one as the source and the new one as the destination. To switch from one Time Machine destination, or turn Time Machine on or off, use the Time Machine pane of System Preferences. Open the Time Machine pane of System Preferences and turn off Time Machine. Make sure both your current backup disk and your new disk are connected and mounted in the Finder. Open Disk Utility (in /Applications/Utilities). In the list on the left, select your new disk (the topmost icon, not any indented volume names) and click on the Partition tab. From the Volume Scheme pop-up menu, choose 1 Partition. Click on Options and select either GUID Partition Table (if you’re using an Intel-based Mac) or Apple Partition Map (for a PowerPC-based Mac). Click on OK. Enter a name for your new backup volume (your choice), make sure the Format pop-up menu is set to Mac OS Extended (Journaled), and click on Apply. Warning: this erases the entire disk! Click on the Restore tab. Drag your current local backup volume (the indented volume name, not the disk name) from the list on the left into Disk Utility’s Source field. Drag your newly attached and partitioned disk from the list on the left into the Destination field. Make sure the Erase Destination checkbox is selected, as it should be by default. Click on Restore, and click Restore again to confirm. Now be prepared to wait while Disk Utility copies the files—this process could take hours or even days. When the restoration is finished, quit Disk Utility. Return to the Time Machine preference pane, click on Select Disk (or Change Disk, in Leopard), and select your new disk as the destination. Time Machine backups should then proceed normally. Joe Kissell is the senior editor of TidBits and author of the e-book Take Control of Mac OS X Backups.